Sean Dyche was proud of his players as they just fell short in the Europa League play-off against Olympiakos. Burnley were held 1-1 on the night after a dominant performance, and Dyche felt his side did enough to win the second leg - and could have overturned their 3-1 first leg deficit had they been more clinical. Daniel Podence nicked a late breakaway goal to kill the tie. 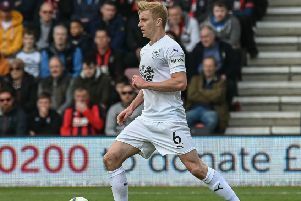 Summer signing Matej Vydra equalised after making his debut off the bench, and Dyche said: “Excellent performance from start to finish, creates so many opportunities to win the game, but didn’t quite win it of course. “Just to win tonight would have been the least we deserved, and probably to go through if we take our chances, but we didn’t, and that is the only blot on the copybook really. “But we were back to us, our identity, a dominant performance, the feel and energy, never say die attitude I loved, the relentlessness - we still nicked a goal, still created chances at the death. And Dyche has enjoyed the Europa League experience, as Burnley returned to continental football for the first time since 1966/67: “Three qualifying rounds is six games, I think Sir Alex won it in five back in the day so I feel pretty experienced! “I think we’ve learned a lot on and off the pitch, and I think you saw a side that wanted it to carry on. “That’s important, considering how many of you have been saying no one wants it. “That’s our mentality, we want to win every game we play.